As a driver, vehicle fires are some of the most terrifying occurrences that could happen on the road. However, these accidents are more common than you might think. According to the U.S. Fire Administration, an estimated 171,500 vehicle fires occur in the U.S. annually. These fires result in an estimated 345 deaths and 1,300 injuries per year. Safe driving and regular maintenance can help reduce the risk of vehicle fire, but it is always best to be prepared in the event of an accident. Follow these tips to ensure a safe escape in case you experience a vehicle fire. The first sign of a burning vehicle is the smell. If you smell burning rubber or plastic, pull over immediately. Do not wait until you reach your destination to investigate. Pull over in a safe location and examine the issue. The same advice applies if you see smoke or fire coming from your hood. If you wait too long, the vehicle could catch fire while you are still driving – an extremely dangerous situation for you and others on the road. Once you have pulled over in a safe location, remove yourself and all passengers from the car. Make sure to completely shut off the engine – the heat and fuel from this mechanism is likely contributing to the burning smell and smoke from your car. In addition, stopping the flow of fuel may prevent a full-blown fire from happening. As soon as you are out of the car, make sure to get as far away as you can, at least 150 feet away. However, do not run into traffic or stand in the middle of the road. Make sure the environment is safe before stepping away. If you see flames coming from the hood of your car, do not open or approach it. Do not use a fire extinguisher to stifle the flames. Get away from the vehicle and call 911 immediately. If you see smoke, but not flames, come from your hood, you can use a fire extinguisher. Crack open the hood, but do not open it all the way – oxygen from the environment can cause flames and aggravate the fire. Use the fire extinguisher on the vehicle from a few feet away. If you notice smoke or flames coming from the rear of your vehicle, do not investigate. Do not open the rear of the vehicle or attempt to use a fire extinguisher. This could be the beginning of a serious vehicle fire. Call 911 immediately and get as far away from the car as you can. You might think that the vehicle fire is not serious and it may seem resolved after you turn off the car. However, it is much better to call 911 and find out that your vehicle is fine than to assume you have the situation under control. You never know the circumstances of the fire and certain actions could trigger a bigger one. As soon as you get out of your vehicle, call emergency services and ask for the fire department. When you have 911 on the way, you want to make sure that other vehicles on the road stay safe as well. If your vehicle fire grows, it can cause harm to passing cars and pedestrians alike. Warn any onlookers or unprotected people in the area of the situation and tell them to keep away from the vehicle. If you have a signaling device, you can use it to warn passing traffic of the situation. Regular maintenance and safe driving can effectively prevent the majority of vehicle fires. Make sure to take your car for regular tune-ups at least once per year. In addition, if you notice issues with your fuses or fuel pipes, visit a mechanic immediately. You should also carry a fire extinguisher in your trunk in case of an emergency. Car fires could also be caused by faulty car parts. 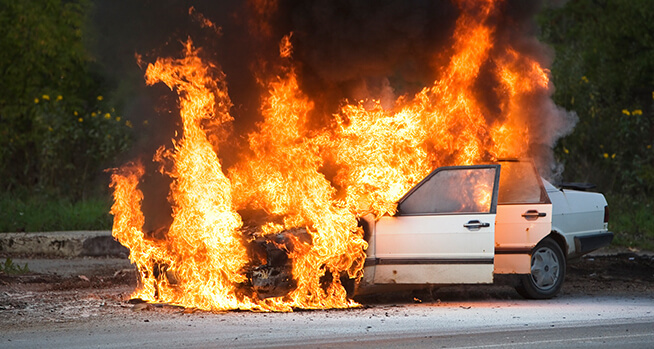 If you believe that your car fire was caused by a negligent third party and you or a loved one was injured, don’t hesitate to contact our office in San Diego, our injury lawyer can answer any questions you may have.